Carrots Should Taste Like Cheetos! Over the weekend, I learned that I'm not the only sentimental one in the house. I'm the only female in the house. I'm the only one who wears pink, I'm the only one who likes Barbies, and I'm the only one who likes pedicures, but I'm not the only one who gets emotional over holiday memories! Friday night was hubby's office holiday party, at the Double Tree Hotel Oak Brook, so we were spending the night at the hotel. The boys were getting a nice treat - sleepover at Grandma's house! All was ready, bags packed, dress in the car, etc, and I was dropping off my second grade son at school when it happened. He stopped dead and looked up at me. Uh oh, now what??? He all of the sudden realized that he wasn't going to be home tonight. Which was bad for two reasons. First, and most important, was the advent calendar I put together. I found an amazing little wreath of round boxes that I filled with good candy (instead of the pre-filled ones that have the crap-tastic chocolate - why waste the calories, am I right?) and we open it for dessert every night. I told him either we would just get to have double the chocolate on Saturday, or maybe Grandma would take him by the house on the way home from school to get it, and yes he and his brother could double up and have all 4 pieces. The other problem was the Elf on the Shelf. How would he know to leave and come back if no one is home? Again, easily explained - magic. But these weren't even the kickers for the weekend. We were at breakfast the next morning, feeling better after our night of, ahem, indulgence - with a little help from some strong coffee, and of course, bacon, when hubby's cell rings. It's Mom - um, did we remember today is St. Nicholas Day? Crud.....ooops....my mother always put something in our stockings on December 6th in honor of St. Nicholas Day. So I continued the tradition. And with no help from ANYONE, our 7 and a half year old remembered out of the blue all about it, and asked if Grandma could take him home to see if there was something in his stocking!!!!!! Thankfully, Mom is nothing if not a good liar....she proceeded to tell him that St. Nicholas didn't know that the kids were with her, and had thought they were with us at the hotel so he left the gifts with us - so WE had the presents....good cover, Ma!!! So scramble though we had to, we went and got those little gifts, because it was just so dang adorable that he remembered it. He remembered that this was something we did each year. At least someone in our family does! It warms my heart that the little things I do each day during the holiday season make such a difference to my boys. They're such little loves, but sometimes they're such guys. It's nice to be reminded that they do remember and care about the things we do as a family, and that the traditions we do year to year are treasured by them, and might become traditions they do with their own kids. Yay! Seems like there was something in the air this week!! Cool tradition. Thanks - I like any tradition that means chocolate daily for me, of course! LOL! I hate thinking about what I am going to eat because, let’s face it, junk food tastes so much better than, say, a carrot. 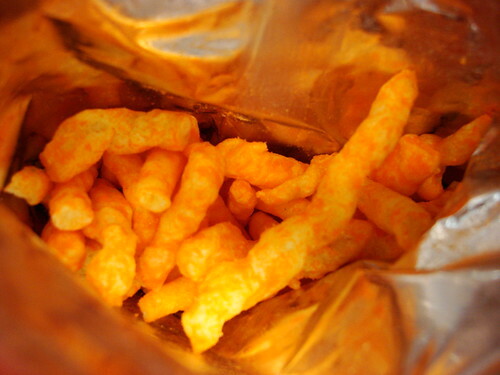 The cheeto and the carrot are the same color. Why aren’t they the same calorie and fat content? It isn’t fair, if you ask me. The carrot really should try and live up to the flavor of the cheeto, have marketing competitions. I can just see it – “Try the new and improved carrot, now with nacho flavoring!” If only nature would catch up with flavor trends. ALWAYS Back Up Your Pictures - PLEASE!